Recently I had Synthchaser repair my MC8, and he made this nice little video of the process! I recently had my Roland MC8 Microcomposer repaired by Synthchaser, and in order to give it a good test, I fired up the old data file of ODD RHYTHMS (previously seen here), and this time I hooked it up to an Arp Axxe, which provides all the different sounds you hear in this version (via multitracking each monophonic part). There’s no EQ or any other effects applied- just pure Arp! My MC-8 is ailing at the moment, which means that when I turn it on, it does it own bit of “micro-composing.” Here it is connected to my Sequential Pro-One synth. MC8s rarely come up for sale, so I generally take note when they do. Recently an oddly-colored one appeared on eBay- instead of the usual brown top, it had a blue top. Also, the serial number on this one was 600000. It’s definitely earlier than my other MC8, which is serial number 680904. Since the bidding was very slow up until the last day, I decided to place a bid myself just to make sure it sold for a decent amount. Well, probably mostly due to the fact that it was missing the crucial cable that links the sequencer to the interface, it ended up selling for chump change, and I won it (if only inadvertently) for $224.50! I definitely don’t need TWO of these things, but what the heck. I received the unit the other day, and I’m convinced that the blue paint job is factory, though I’ve never seen another like it. It has the full 16k memory (additional memory could be purchased as an expensive daughter board). Also, it has a two-prong power cable instead of three prongs. There may be other differences lurking inside. I don’t know what serial number these started at, or how the numbering scheme worked, but given that only a few hundred of them were ever made, I’m sort of fantasizing that maybe 600000 could mean this was the first one off the line…? Who knows… If you own an MC8, please leave a comment here with the serial number and memory capacity, and also of course whether you have a blue one like this. I fired it up using the cable from my other MC8, and it appears to be working OK. I’m not really sure what sort of use I’ll get from this one other than as a collector’s item, so I suspect I’ll probably have a cable fashioned for it and eventually put it back up for sale. We’ll see. It’s too bad this came up only after Ralph passed, or I’d probably have had it shipped directly to him, since he hadn’t owned an MC8 in decades. I was very shocked and saddened to receive an email from Jeff Van Dyck yesterday announcing the passing of his father, Ralph Dyck, on May 20th, due to a sudden stroke (coincidentally on the same date that Ray Manzarek passed). 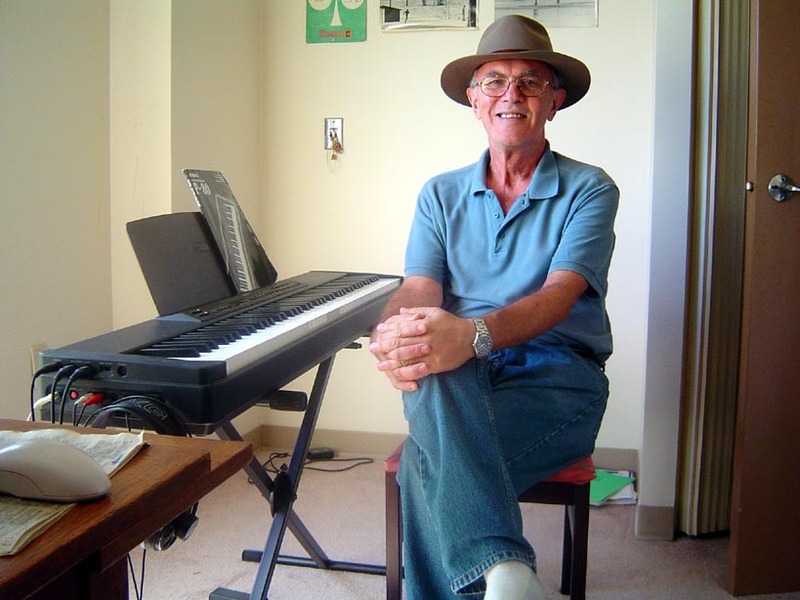 Readers of this blog will, of course, be very familiar with Ralph as the “godfather” of the Roland MC8 Micro-Composer, but to most of the music world he remained an unsung hero. Ralph’s primary background was in jazz and commercial music, and I got the sense that he never quite understood the full extent of the influence of his innovations in the realm of electronic pop music production. Suffice it to say that the Roland MC8 provided the definitive blueprint for the way that we work with modern sequencers. Initially Ralph was a bit tentative about sharing too much with a complete stranger (albeit an enthusiastic one), but I think I won him over by laboriously keying-in a piece of his called “Odd Rhythms,” which appears as a demo sequence in the MC8 owner’s manual. Over the few brief years that I was in touch with Ralph, we corresponded on a great variety of topics, both music-related and not. He was always very interested to hear of the goings-on in my world, and always very proud to share his story as well as proud-papa stories of his son Jeff’s work. In more recent emails, I had noticed a definite tone of anguish as he struggled with various health issues. He was working on restoring his old synthesizers, but was finding the work increasingly difficult and frustrating. Nevertheless, I’m happy that he was able to have one last go at what was clearly one of his passions in life, and I hope that others will be able to step in to finish the restoration work that he started. My only regrets are that I never got a chance to meet Ralph in person, and that I was not able to document his story more completely while he was still with us. Being a mere amateur/fanboy myself, I had attempted to find a qualified music tech journalist to take on the task and write a proper article, but nothing came of those efforts. Ralph had even entertained the idea of writing his own memoir, but again, it was not to be. Hopefully what I’ve cobbled together here will suffice for now. Jeff is organizing a wake for Ralph, which will be open to the public. I personally am unable to attend, but I encourage attendance by any music technology enthusiasts who are able to. Ralph was clearly concerned about documenting his legacy in some way, and certainly got a kick out of knowing that there were people out there who knew of him and appreciated his contributions to the development and culture of electronic music. There will be some snacks and a couple of drink tickets per person. Jeff be presenting a slide show at 2pm and opening the mic for speeches afterwards. Rest in peace, Ralph, and thank you again for shining a light into the future for us. I earned most of my living in the ’70s by doing films for the NFB (National Film Board of Canada) and commercials for GGP (Griffith Gibson Productions) and directly for agencies like J. Walter Thompson etc. Here’s an account of three spots for CPAIR (Canadian Pacific Airlines, still the best I ever flew to LA). They made the most money for me because I got residuals from them through the union every 3 months, for as long as 2 years! CPAIR Versions 2 and 3 using Sequencer #2 were done at Singwell Studios in 1976 where I was located for 6 months. 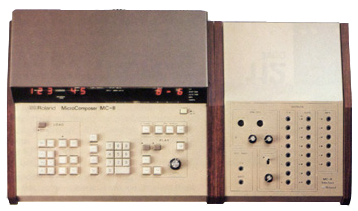 Because I forget details easily it’s possible that CPAIR Version 3 was done on the MC-8 in 1977 at Total Sounds West- I forget the timeline. Joani Taylor sang the ‘Orange is Beautiful’ logos. I’m playing a Fender Rhodes on V2, and Roland electronic piano on V3. By this time I was using a Roland System 700 modular, and I used Solina Strings throughout. I had real flute and drums because I had a budget for a change. Those commercials kept me solvent for a year or two. These were highlights of my commercial life at the time and they certainly used my sequencers, I’m just not sure if the MC-8 was used for the last one. Actually, producing commercials was right up my alley, they had to be very precise in time and message, they were something I could handle, not like writing a symphony! Some time ago I had an informal Facebook exchange with Richard James Burgess of the band Landscape (among the earliest adopters of the MC8). I had intended to conduct a formal interview with Richard, but never quite got around to it, so I’ve decided to post our original chat here. Pea: Hi Richard, just thought I’d drop you a line to confess an extreme act of geekery I committed last week… I bought a pristine Roland MC-8 and, whilst setting it up and trying to translate the mimeographed manual, I had my scuffed up “Tearooms of Mars” LP playing in the background. Incidentally, I’ve been chatting w/ Chris Carter who, I understand, bought Landscape’s MC-8 long ago. Richard: Well geeks unite and rule the world – I just bought my original MC8 back from the person that Chris sold it to. I just had to have it. The very first recorded use with Landscape was on “European Man” which was recorded way ahead of the rest of the album in Red Bus studios. At the time it was called “Route Nationale” and had no lyrics. 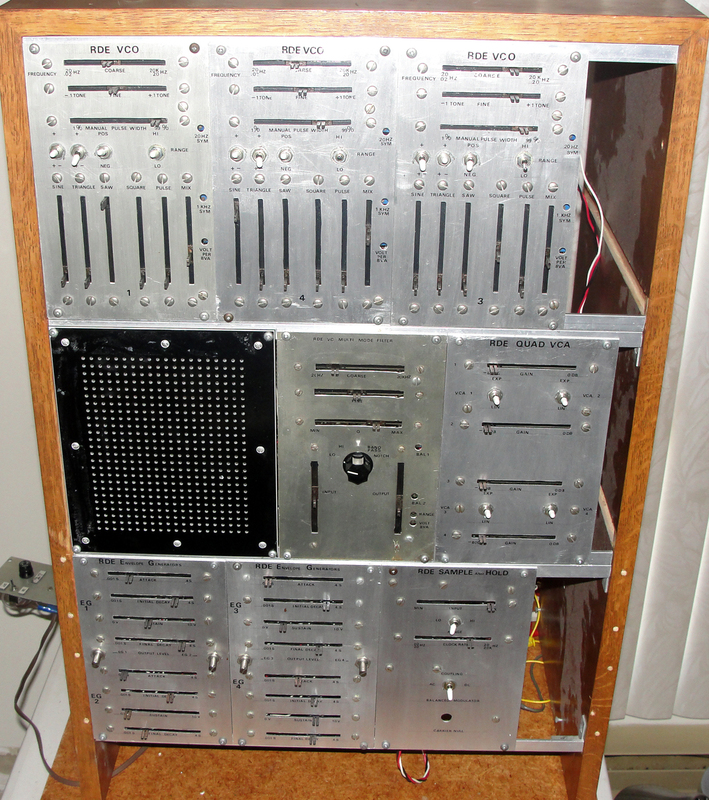 John L. Walters still has our MC4 but all my System 100Ms were stolen from my house in the early eighties. I would love to get those back. They were modified so I would recognize them if I ever came across them again. Pea: Wow, bummer about the System 100Ms, but it’s great to hear that you managed to get your old MC8 back! Chris will be glad to hear that for sure! Does it still work ok? Richard: It’s great to have it back. I don’t really know why I wanted it other than it was such an important part of my life and I just felt that I had to have it. Mine has some wear on it but seems to work. I haven’t tried loading any old data tapes, I have them all. Unfortunately that was the sticky shed era of tape so it’s possible they might need baking or might not work at all. We did keep all our scores which were fully written out so we could reconstruct if we needed to. Somehow I don’t see us doing that anytime soon. Pea: It would be a fun experiment to bake those tapes and see if they’ll load. As long as you can get one good pass that will load, then you can re-save the data from the MC-8 straight into your computer. Did you score things out on the Roland graph charts? Richard: We scored everything on music manuscript. We tended to write out all the parts anyway just for rehearsal purposes and then we used to write the numbers for the MC8 above the notation. That saved our butts a couple of times when the MC8 lost all data – most notably at midnight the night before we did [BBC technology TV show] “Tomorrow’s World” demonstrating the MC8. There was a thunderstorm and we had spent nearly all day programming a piece which we hadn’t backed up yet. The MC8 blinked and everything was gone. Fortunately we had written down the numbers as we went so we just sat there with John reading them off and me typing them in. In fact if you listen to “European Man” you can hear a voice mixed low that is reading off a series of numbers and that’s what they are – the MC8 numbers. I think we got that idea from that night. Richard: I can’t imagine anyone figured out what we were doing in the song. We found it amusing but we were all major geeks and geeks weren’t fashionable and didn’t rule the world in 1979. That’s funny that you were able to discern what we were saying. We generally used [time base] 24 because it divides by four and three and is fine enough that we could get the fastest parts we needed in semiquavers and triplets. The major technical hurdle we had on the “Tearooms” album was synching the CR78 with the MC8 (on the track “The Tearooms of Mars…“) and we did it by generating a square wave, recording that and locking the CR78 to that. 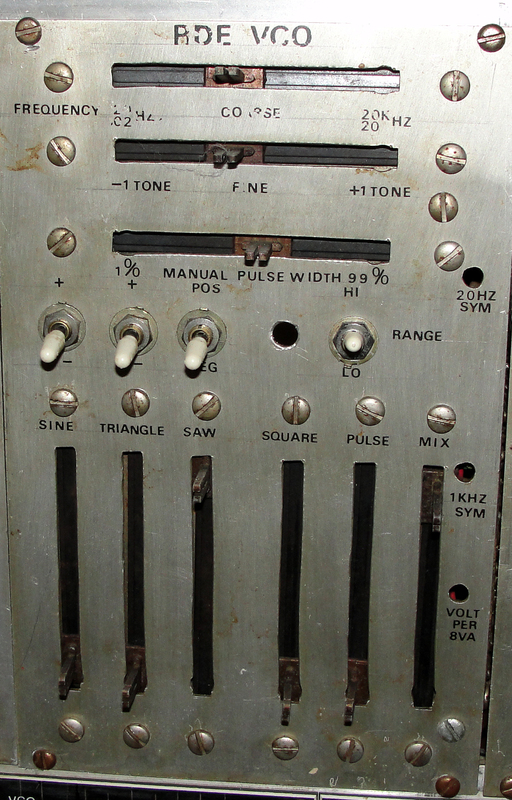 It was hit and miss because the CR78 had to read every tooth of the square or it would slip out of synch. I seem to remember we got the square wave wrong at first and the CR78 was running at double speed. It was very exciting when we cracked it. Pea: You also programmed the MC8 for the band Shock, right? Richard: Oh yes, that was all me. Rusty Egan brought the group and the song and I programmed everything in my home studio and recorded it at Mayfair Studios in South Moulton St. with John Hudson engineering. It was the System 100Ms with the 10x gate modification on the bass line for sure. I did all their recordings and I wrote the rest of the songs with various members and Rusty. He and I wrote the B side in about ten minutes at my house – RERB – our initials – very imaginative – but it still gets played in clubs to this day. I loved this group- they were so outrageous! This was a very fun time both personally and creatively. Pea: I particularly like the track “Dynamo Beat.” Can you tell me anything about that? Pea: I’m sure to you it probably seems like a head-scratcher why anyone in this day and age would voluntarily subject himself to the hassles of dealing with ancient sync dilemmas, but for me that’s part of the fun and also it’s a way of working that inevitably produces some idiosyncratic results that you wouldn’t get by doing things the “easy way.” I’m definitely after that metronomic Human League type groove. Richard: I think the machine definitely influences the result so I don’t see it as odd to want to use the MC8. I have thought about it myself.The same thing applies to analogue sequencers. Like I said, we synched the MC8 to the CR78 by programming a square wave to come out of the mulitplex outputs and then we adjusted the level through a console until it ran the CR78. Most of those old drum machines run on simple square waves with no flags. Getting them to run in the same time is less of a problem than getting them to start at the right time. I used the MC8 in preference to later machines because of the timing. I found early Cubase to be shaky (it’s fine now) and SMPTE Track from Hybrid Arts was very sensitive to processor load. I always liked the timing of the Linn 9000 and I still have mine. I don’t know about the DMX but the 808 should lock tight – it’s only one machine later than the CR78 if I recall correctly. Pea: I read online that you’re credited with coining the term “New Romantic.” Any truth to that, and if so, is there a story? Richard: We were messing around with a lot of terms to describe what was going on. “Futurism” was one term that stuck for a bit and that applied to groups like Landscape and Ultravox because of the synth connection and more sci-fi kind of imaging. Landscape consciously created the term “EDM” (as in “electronic dance music”) and we put that on the cover of the single of “European Man.” I was aware that the movement needed a name in order to really catch on. Punk had been happening for the past three or four years and that was losing steam, the Blitz was somewhat of a reaction against the grimness of that ethos and the Blitz really elevated individualism in terms of dress and makeup. There was the heroic element, lots of designers and artists and the whole movement seemed like a reaction against the harsh realities of the time. The Romantic movement represented something somewhat similar in the reaction to the Industrial Revolution and visually “New Romantic” seemed like a good fit. Why that stuck and “Futurism” or “EDM” didn’t is a consequence of what captured the imagination of the media. Pea: Thanks so much for taking the time to dredge up all this minutiae from your past! Richard: It was just something I did but I knew at the time that it was a huge breakthrough, once I bought the MC8 and John and I started programming it I felt like we’d caught a huge wave and we were just riding it. I remember giving a speech at the Roland Sales convention in Ealing and I said this is the way all records will be made in the future. I think there were less than a dozen MC8s in the world at the time. They all looked at me as if I was mad, and I thought maybe I had overstated it (and of course it’s not all records), but I smile about that occasionally when I listen to the radio now and over the past thirty years. I just wrote some stuff about [the MC8] for the fourth edition of my book. It’s an underrated machine in terms of the evolution of how we got to where we are now. Encouraged by the recovery of his Carson Graham synth, Ralph went in search of another synth he made around the same time for the UBC. Bob Pritchard of the UBC Music Dept. confirmed that the synth was still sitting offline in his office, and after a quick consultation with the school’s administration, it was decided to gift the synth back to its original creator! Ralph has been working on the synth for a few months now. Here’s a bit of Q&A about it, along with some pics and sound examples. 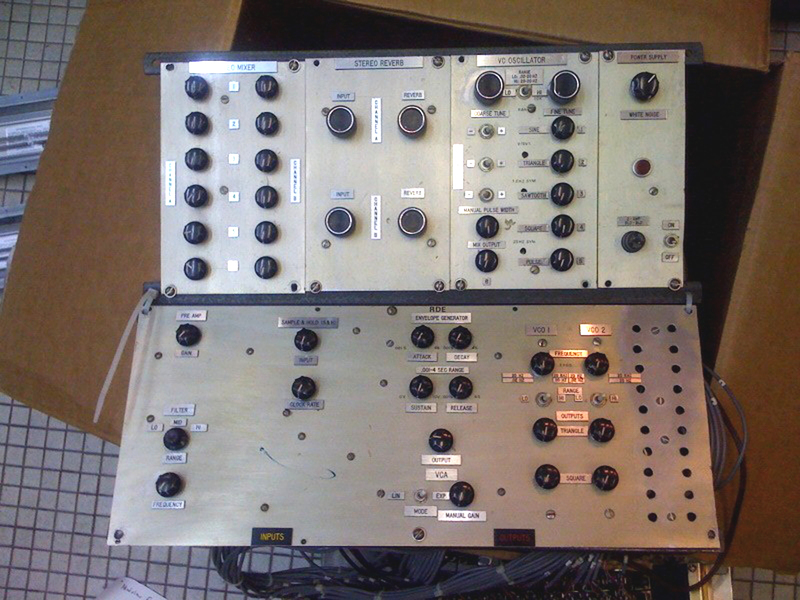 Q: Can you tell us a bit about the history of this synth, why it was built, and how you arrived at its design? Ralph: Well, I don’t know where to begin because I don’t remember very much at all, I have a clear memory of the Carson Graham but not anything detailed about the UBC. I had been using the UBC Electronic Music lab for about 2 years at that point and had already built my own synthesizer. Cortland Hultberg was the professor there and he and I conspired to make a copy of my synth. He had a way with budgets and would funnel funds to us (Wayne Carr and myself) to add on to the Lab, this time he must have found a bunch of money. I remember that I wasn’t using the Lab at all because I had my own stuff now! He must have had some students that helped in the installation of the synth, my 1st one was completed months before and I learned from my mistakes and made the UBC modules better, they still are! The front panels are 8″ by 4″ aluminum sheets for which I cut slots for slide pots by hand using a nibbling tool. I developed a ferocious grip. The UBC ones, I just noticed recently were done by machine! Obviously I did the Letraset lettering as I had done before, by hand. Here are 2 photos, my VCO from the 1st synth and my VCO from the UBC. We kept everything as close to my original synth as possible except for the box containing it, I had one made for my own synth but UBC’s lab was circular with an opening so one was surrounded by equipment and the Moog and Buchla had their own cases where as mine (RDE) was mounted in a very nice pre-made oak veneered cabinet, there were gaps at the ends of each module row because of it being made for something else. It’s still in the same cabinet, there was also a satellite cabinet to the left that apparently contained VCFs (which I had made later) and a sub-mixer and additional matrix patch panel. The synth cabinet still has 3 holes for cables to attach to the satellite cabinet. The installation must have been done by students with me being there part time because I was very busy playing with the Paul Horn Quintet and we were traveling a lot. Actually, if any of the UBC students who helped in installing this synth read this blog then they should get in touch with me, please leave a comment here. Q: Can you give a detailed rundown of the various components and signal flow of the synth? 4 VCOs (only 3 now) with Sine, Triangle, Sawtooth, Square, Pulse and Mix plus additional switches to select polarity of waveforms. Sure sounds like a Function Generator to me! (except it’s 1 volt/octave). The 2 ranges of the VCO are 20Hz to 20Khz and 0.02Hz to 20Hz. The Sawtooth is selectable as Positive or Negative going. The Pulse Width goes from 1% to 99% and is voltage controlled, 10% per volt. 4 VCAs selectable as Exponential or Linear. 6db per volt. 4 ADSRs. The first complex circuit I ever designed all by myself, they still work! Controls for Attack, Decay, Sustain and Release and Output level. A Sample & Hold with oscillator. There is an input level control as well as an oscillator frequency adjust which has the same specs as my VCO regarding frequency. I thought there was a Ring Modulator but it has been removed! What is missing is the satellite cabinet containing the VCFs, Mixer and 2nd matrix panel. Apparently most of that will never to be seen again along with the power supply. The synth is really a standard one in that usually for a simple patch one might go VCO to VCO for vibrato modulation, the modulated VCO to a VCA controlled by an ADSR. The VCO pitch might come from a keyboard CV and the ADSR gate from the keyboard Gate out. No filter though, seeing that I’m fixing this up for my son to use I’m going to have to reverse engineer my old VCFs and build copies of them, oh joy! My son Jeff van Dyck is really into digital synthesis but grew up on Modular systems so this will add a different color to the scheme of things. Q: Can you give a summary of the current state of the synth, ie what works, what doesn’t, and what needs to be replaced? Ralph: Actually, it’s really amazing! Everything works perfectly! As I said before, VCFs are very necessary and a Sub-Mixer as well. The matrix patch panel is 25 vertical by 20 horizontal so I can’t hook up everything to it. Some patch panel 1/4″ jacks would be easiest by far and durable as well (and cheap!). Jeff and I have to think about exactly what to do. There’s really plenty of room on the existing frame to add extra items. The VCFs will have to be on a perf board wired by hand and controlled with rotary pots, same with the sub-mixer. 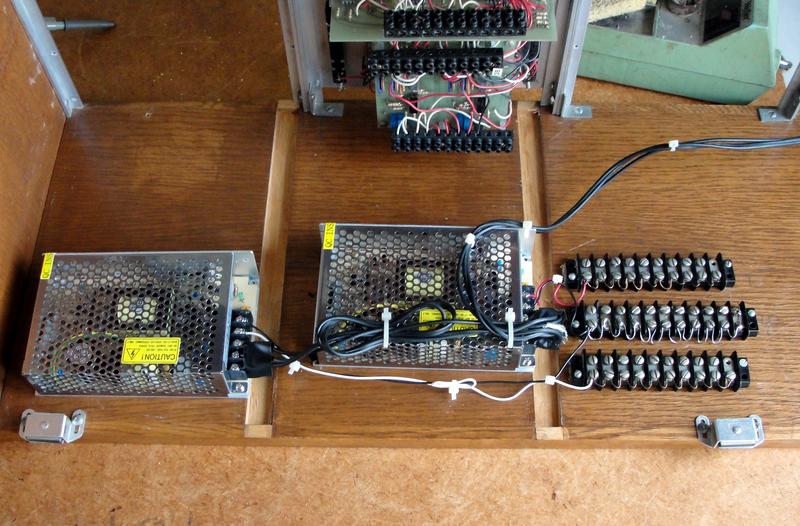 For power supplies I’m going to use two industrial switching supplies, 60 watts @15 volts and 4 amps. I’ll wire them up for +/- 15 volt operation. This works out very well and allowed me to do all of the wiring including the power supplies in less than a week whereas it would have taken months to drill new panels with many more cables. However, I satisfied all of my concerns when I improvised this little ditty, no keyboard for control, all I had was the Sample and Hold controlling the modules and vice versa. OK, so this isn’t directly related to the MC8, but it involves Ralph Dyck, and it’s a cool story, and it’s high time that I update this blog, so here ya go! 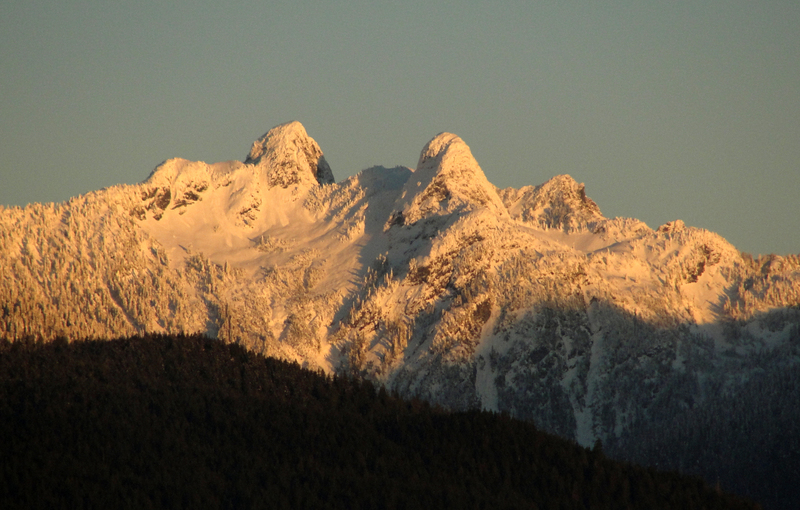 A couple years ago, Ralph mentioned to me that in the early-70s he had built a couple of custom analog synthesizers for local schools – UBC and Carson Graham Senior Secondary. I attempted to contact the music departments of both of these schools. The UBC music department still had theirs, but the Carson Graham synth was missing in action. Fast forward to a few weeks ago, and I get an email from Ralph that an acquaintance of his in Vancouver recognized Ralph’s handiwork in a craiglist ad for a homebrew synth- it was the long-lost Carson Graham synth! 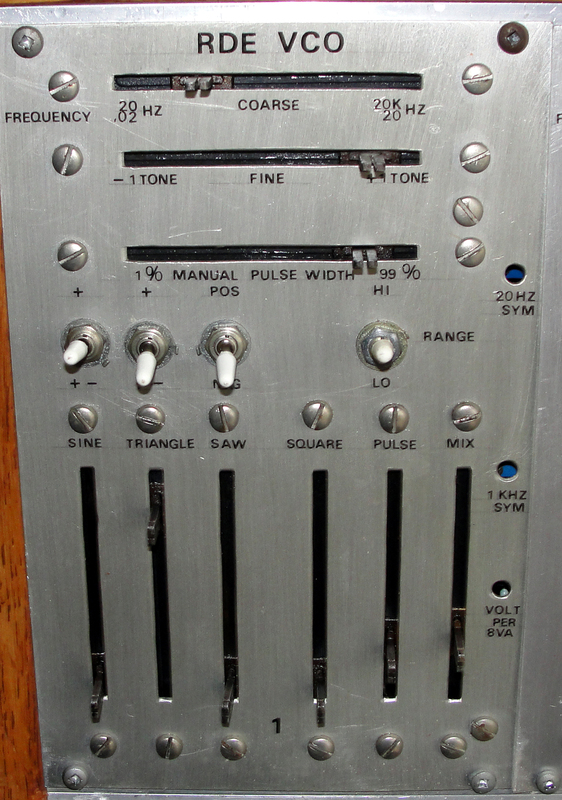 Q: Can you tell me a bit about the history of this synth, why it was built, and how you arrived at its design? Ralph: I had made some friends at UBC in the music department and they all knew about the synthesizer I had made in 1971. One of those friends was Rob Carr who became a music teacher at Carson Graham Senior Secondary (high school). He was able to get the school to budget some money to build a small synthesizer for the music department. Remember, in those days there were no low cost synthesizers on the market, just big modular systems like Moog, Arp and Buchla. In fact, a friend of mine, maybe that year, bought a MiniMoog and asked me to have a look at it, I’m not sure about the timing. Rob Carr gave me his budget figures and I figured out what I could make for him. He got some money so I could start to buy parts, I had an account at the largest electronics store in Vancouver and bought all of the opamps, transistors, resistors, capacitors, connecters etc. I had a plan and that was to make a subset of my own synth that I had built. I figure that this must have been early 1972 because of where I was living at the time, I had started to work jazz gigs with the Paul Horn Quintet then as well. It was an operation on the cheap, a piano player working in the landlady’s basement breadboarding circuits and testing them. Some of the designs are quite different from the circuits I had already done the year before. I’ll get into that next. I can’t give an accurate timeline for building this synth but it certainly took 3 months or so, I guess. I think that we were all a bit excited by having this system as the first synth in a high school here. Ralph: Once the synth had been delivered to my apartment I could see right away that the patching had been heavily modified by someone at the school, I guess. I’m sure that they wanted to make it more sturdy and professional by using rack mount telephone patch bays, the ring-tip and sleeve types, like the old telephone exchanges. They were built to take a lot of use and abuse. The Main unit I’ll call Rack 2, because that’s what I’ve called it the past week, Rack 1 is an auxiliary unit. Rack 2 has, left to right, a PreAmp and Low Pass Filter on a vector board, hand wired. I imagine the PreAmp is X10 so, the Filter has 3 switchable ranges and is not voltage controlled, I guess, to cut costs and I hadn’t finished the design of my VCF yet, it was to have Low Pass, Band Pass, Notch and High Pass at 12db/octave with resonance. To continue, there are 3 circuit boards, 2 hand wired vector boards and one pc board. The vector boards are the Sample and Hold clock and the Ring Modulator. The pc board is the Sample and Hold. To the right of them is the VCA which has a pc board but doesn’t work, probably a bad 741 opamp, static was a big problem for the outputs of 741s, too easy to blow them up. To the right of the VCA is the ADSR Envelope Generator which is the first circuit that I designed without any help from my engineer friends, I was proud of that, done the year before. The same thing I fear happened to its output which was dead. However, by searching on the pc board I found a completely intact envelope signal that was attenuated by a factor of 12. Well, I thought, I’ll amplify it and put it out which is what I did with an LF353 dual opamp. 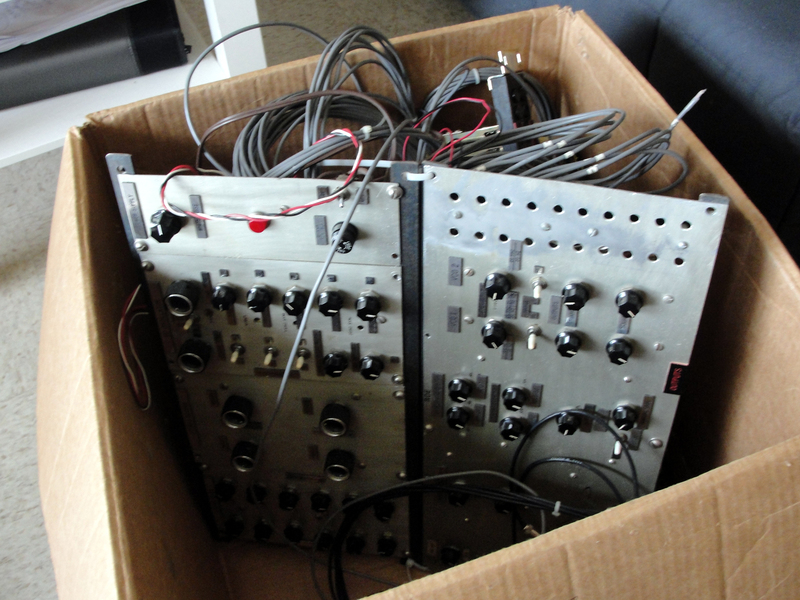 We’ll have to put in a VCA kit to replace the one there and all of the synth will be complete. To the right of the ADSR are the 2 simple VCOs with Triangle and Square Wave outputs, they work perfectly. Rack 1 is an auxiliary unit that has, left to right, a 6 input, stereo output mixer and a white noise generator, all built on a hand wired vector board. It is followed by a Stereo Hammond Spring Reverb pc board of which the Left channel is dead! Who knows what the problem is, I spent hours trying to make the Left channel work and had no idea what the wiring was, then I tried the Right channel, it worked perfectly the first time! Murphy Lives. To the right of the reverb is the full VCO which is the type that I built for my own synth. It is .02hz-20hz and 20hz-20khz with Sine, Triangle, Sawtooth, Square and VC Pulse outputs, all waveforms are available separately and mixed together. The waveforms are switchable from ± 5volts for audio and to 0-10volts for control purposes, the VCO is 1volt/octave (as are the Rack 2 VCOs). On the right hand side of Rack 1 are the 20 holes for my 1/4″ jack socket patch bay and replaced by a 24 connector terminal block which was connected to the telephone patch bays. I wish they wouldn’t have done that. Well, the synth was made for experimenting by the students, I’m sure that it was a huge job to put in the patch bays and rack mountings and making sure that electrically everything was correct. Ralph: Everything works, amazingly, EXCEPT the VCA and the Left channel of the Stereo Reverb. The ADSR has a small circuit attached to provide a proper output. A VCA module in kit form would be perfect for this, it must be ± 15volt supply, 6db/volt or linear and ± 5volts audio output. The reverb Left channel can be fixed but it must be taken apart and probed to find out which opamp is dead. Use the Right channel as a guide, it’s the same. Thanks to Ralph for this quick interview, and as soon as the synth is in fully restored condition, we’ll update the blog with further details, video, sound clips, etc! This blog will be an information resource for the 1977 Roland MC-8 Micro-Composer, the grand-daddy of all modern digital sequencers. I won’t be able to offer any comprehensive tech support here, but hopefully over time there will be enough info accumulated to get you going. Please stay tuned while I gradually add stuff! In the meantime, a good intro to the MC-8 may be found in the article that Chris Carter wrote for Sound On Sound Magazine in the late 90s.